"This is a nice change from a traditional potato salad. It's very light and goes over great at potlucks!" Bring a large pot of salted water to a boil. Add potatoes and cook until tender but still firm, about 15 minutes. Drain, cool and chop. 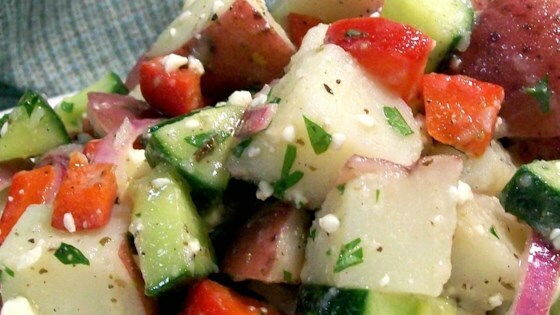 In a large bowl, combine the potatoes, green peppers, cucumbers, red onion and cheese. Whisk together the lemon juice, salad dressing, salt and pepper. Pour over salad and toss to coat. Serve with pita bread wedges if desired. the lemon in this dressing is overpowering. Take it out, and you're really left with cold potatoes in italian dressing. Very light and refreshing, A nice change from traditionally heavy potato salads. This was a big hit at the potluck at work. I onlh added 4oz of feta cheese & I did not serve pita bread either.